GLASGOW PRESTWICK AIRPORT has experienced its busiest day ever, handling more than 10,000 passengers for the first time. The milestone was reached on Friday 27 June – the last official day of school in Scotland and traditionally a busy day for airports with thousands jetting off to the sun. This is reflected in the balance of inbound and outbound passengers, with 5,334 flying out and 4,883 flying in. There were 68 flights on the day, 52 scheduled and 16 charter, with an average load factor of just under 82%. The most popular flights were those serving London (Ryanair) and Majorca (Seguro), each carrying nearly 1,500 passengers. Dublin was also a popular choice with just under 1,000 which helped push the Irish total for the day over 2,000. Glasgow Prestwick Airport chief executive Mark Rodwell said: “The fact that we have just experienced our busiest ever day is a welcome boost as we enter July and August, our two busiest months of the year. He added: “Ryanair are offering sunseekers the chance to extend their summer this year, with new flights from Prestwick to Malaga, Tenerife and Faro starting at the end of October. AND Glasgow Prestwick Airport employees have raised £1,000 for the nearby Malcolm Sargent House through donations from their wages. Workers voted to make Malcolm Sargent House, and it’s parent charity CLIC Sargent, one of the organisations to benefit from the airport’s employee charity fund, and each employee is free to choose the amount they donate every month. 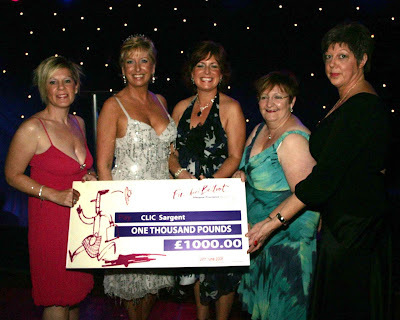 The money was handed over, in the form of a cheque, to the charity’s community fundraising manager May Gilchrist at the CLIC Sargent Ladies Night which took place on Saturday 28 June in the Princess Royal Suite at Ayr Racecourse. A group of employees who purchased their own tickets for the event presented the cheque in front of 450 guests. They were Gillian McPherson, Carol-Anne Elliot, Alison Blackman and Jo Dunlop. The airport also donated flights to be used as raffle prizes at the event. There are currently 284 Ayrshire business stories permanently archived on this site. To locate those of most interest to you, please use the site search facility in the top left hand corner of this page. Type your search term in the white box, then click “SEARCH BLOG”.